TacomaTurf: Timing is Everything........Or is It? Timing is Everything........Or is It? This is a picture of the 6th hole taken last summer. I took it early in the morning when there was a good amount of dew because you can clearly see by the dew pattern that we had some serious pitting of the turf caused by disease. This next picture is a close up of one of the most infected areas and you can see that I removed a sample of turf. That sample was sent to a diagnostic lab and the test results showed that we were fighting a serious outbreak of fairy ring and waitea patch. Now this is when I'm supposed to show you a picture of the golf course today and of course our turf today should be disease free because of what we learned last year. Well this is a picture of some of our fine turf today. Here's another picture of some of our fine turf today. So again we have disease. Again I sent samples to the lab and this time there is no waitea patch, only fairy ring. So things are better but certainly not great. In fact I started writing this post a couple months ago because I was going to show just how great things are today due to the timing of a preventative fungicide application to the fine turf. We did everything we were supposed to do. We monitored soil temperature and applied a preventative fungicide twice this past spring and things were definitely looking good through May and into early June. 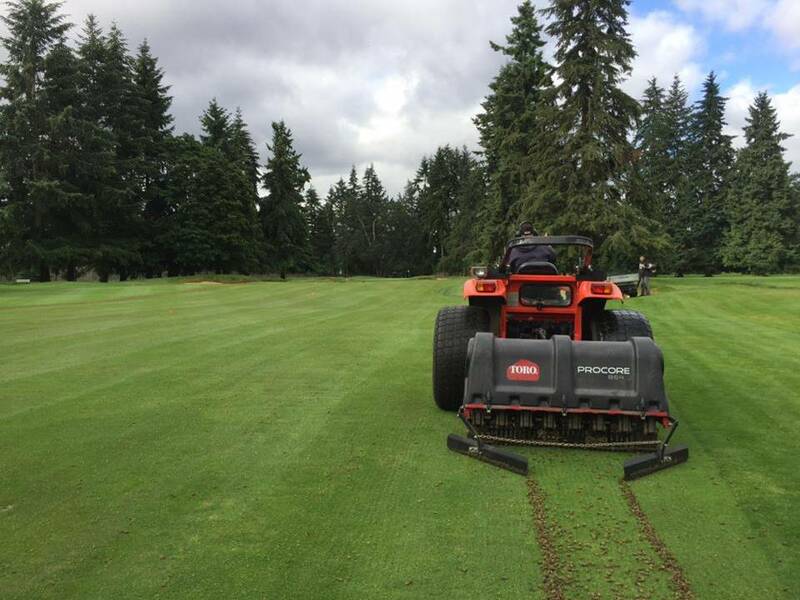 The preventative applications work best when applied at the right time based on soil temperature and we feel like we "nailed it" in regard to timing. After all, timing is everything right? Well, some hot, dry weather hit us in June and we started to see the disease pop up. Some of it got so advanced that we started to loose turf. 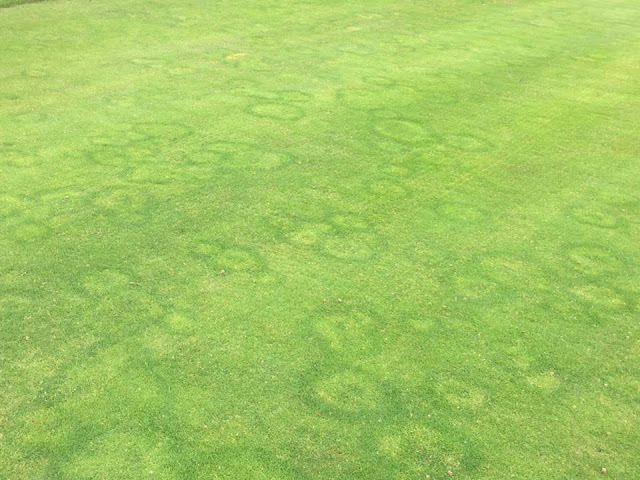 Needless to say my team and I are very frustrated with the persistence of the fairy ring. Spraying more fungicide is not something we want to do and it's not something we can afford to do. We have spot treated some of the worst areas with additional fungicide but it would cost about $9,000 to spray all the fine turf areas. The operating budget can not accommodate an application like that and even if it could, there is no guarantee that another application will solve the problem. So where do we go from here? I can sum it up in one word.........cultivation.